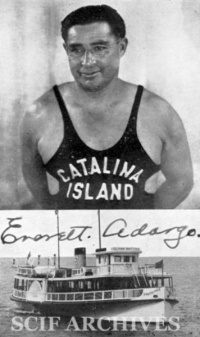 ADARGO, Everett Bernard (1891-1971) [SS#552-22-6354] went to Santa Catalina Island when he was still a baby. 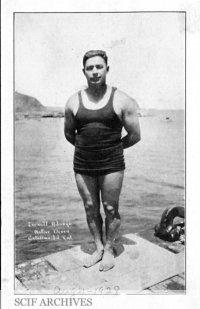 As a youth he dove for coins and worked on the family boats. 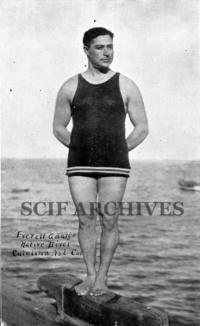 His diving record was 56 feet in three minutes and 15 seconds. Adargo married Candace Kendrick in 1917, and they had three children: Everett Jr. (1918-1971), Kendrick Edward (1920-1991), and Susanne (1928-1995). After his wife died, he moved off island to Garden Grove, California with his son. He died at age 80 in Orange, California. This page was last edited on 20 August 2015, at 10:07.